It’s that time of the year again and the olives are hanging ripe and ready. 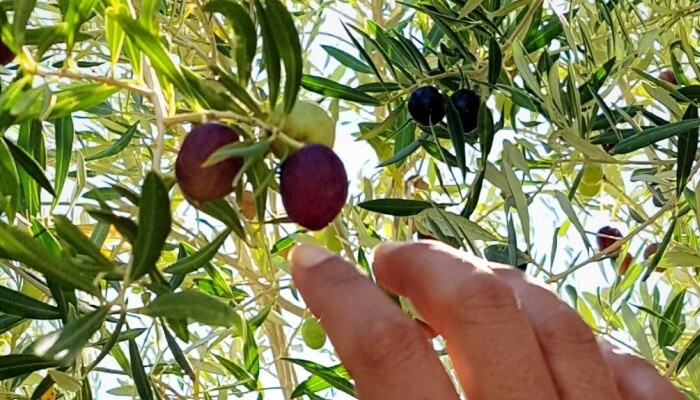 Olive production works in a two year cycles. The olive harvest of 2016 was excellent and by default, this year is not so great. The growing period of an olive happens up till 40 days after pollination through the process of mitoses. Thereafter a lot of water is needed for the olives to develop to their fullest. The Karoo suffered one of the driest summers in many years and we battled to water our orchard as one should. 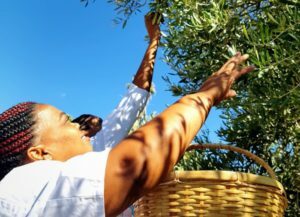 Nonetheless, we are grateful for the beautiful Frantoio and Mission olives we do have and embraced our annual ritual of picking and preserving. After picking the olives, we brine them as fast as possible. As with any fruit, after picking the fermentation process starts immediately. Do not rinse the olives after picking as you would lose the natural sugars that you need for fermentation. Make a 5% water:salt solution (10 litres of water to 500g salt) and leave the olives in the brine for 9 to 10 months in sealed containers. Write the date on the container so that you can establish when the olives are ready. The natural process of fermentation does all the work for you. Remove olives after 9 to 10 months, drain and sort by removing the marked and soft ones. Lay the olives out on trays to oxidize for at least 3 to 6 hours. They will become darker in colour and firmer to the touch. Make a 1 % water:salt solution (10 litres of water to 100g of salt). Add olives to brine and leave at least 3 weeks for osmosis to do it’s job and withdraw the excess salt from olives into the brine. They will then be ready to enjoy. By far my favourite salad. You get to use the leftover bread and the flavours are well balanced. Make sure you have enough ready-to- eat olives at hand, some fresh herbs, ripe tomatoes and anchovies for that essential salt balance. This Tuscany embodied salad has hundreds of different versions which range from the salad in its simplest form of tomato, bread and herbs to more luxurious versions with roasted peppers, anchovies and olives. It is an awesome way to use up old stale ciabatta. Break the bread into rustic crouton sized chunks and place on a tray in the oven to dry out completely. Place the pepper on a baking tray, rub with olive oil and roast at 180°C for approx 20min until the skins start to blister – peel and remove all seeds. In the meantime, bring a pot of water to the boil, make a crisscross on each tomato, blanch for 10 seconds and refresh in ice water. Peel away the skin, quarter and separate the juicy seedy part from the flesh – keep both. To make the dressing, place the tomato juice and seeds in a bowl, season with salt and give it a good mix – add in the red wine vinegar and olive oil whisking all the time. Season and strain through a course strainer. To make the salad – Toss the stale bread with a generous amount of the dressing. Once completely coated and starting to absorb the dressing, add the tomato flesh, roasted peppers, herbs, olives, capers and anchovies. Season (just be careful of all the salty ingredients) and serve.